Every day this country sheds bits of what remaining credibility it has. WASHINGTON DC -- With an incoming Democratic-lead House next month, the Trump Administration and the Republican Party have embraced the season of peace and harmony by proposing a festive two part economic stimulus initiative that will tackle progressive concerns such as climate change and homelessness, all the while growing the economy. However, critics have called this stimulus package less of a gift of goodwill and more of a white elephant gift exchange ultimately designed to "trigger the libs" by spiting them with their own causes. The stimulus bill was written and proposed by economic policy wonk Paul Ryan, who wanted to give one last hurrah before stepping down as Speaker of the House. Though Ryan originally constructed the bill as an ordinary stimulus package, President Trump demanded a collaboration to add his own little artistic spin. Once the two of them put their brains together, the bill soon evolved into the beast that lies before us. With Ryan's Randian economic inspiration and Trump's creative snark and spitefulness, the stimulus plan is a unique blend of neoliberalism, Keynesian spending and a clear and utter contempt for mankind. The first point of the plan is a federal ban on artificial Christmas trees. Every red-blooded American will have no choice but to buy real trees. This will increase demand for evergreen trees, thus giving a major boost to the Christmas tree farm industry. The annual surplus of trees grown each year will gradually reduce our carbon footprint. 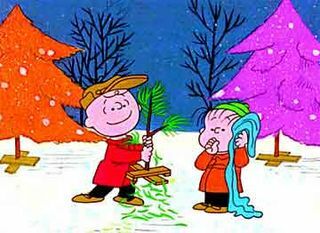 Though buying a Christmas tree isn't mandatory in accordance to that pesky "Constitution" and its "guarantee of religious freedom", (((anyone))) who doesn't buy a tree this year will be called unpatriotic and accused of wanting to kill the environment. A simple, yet ingenious turning of the tables in which conservatives wage a battle in the War on Christmas on the tree-hugging hippies' own soil. Coincidentally, The Donald J. Trump foundation is on record for buying stocks in 70 different Christmas tree farm companies back in October. President Trump has claimed that this was to ensue that Melania had a wide selection of trees to choose from which to decorate the White House, and denied any selfish motives, conflicts of interest, or that he pulled strings with old chums at Rockefeller Center to seize for himself a monopoly on Christmas trees. If there's one thing America has a shortage of, it's fat cats feeding on the flesh of the poor. The second, more crucial and much more heartless point will be a trade negotiation with Iceland to import Jólakötturinn, the legendary Yule Cat. 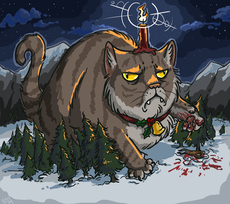 Jólakötturinn is an evil giant cat that eats anyone who doesn't receive new clothes by Christmas Eve. With the monster cat set free to roam over the North American continent, the sheer terror will boost sales for the clothing industry. However, that isn't the major selling point of this idea. By letting the cat eat everyone - everyone - without no new clothes for Christmas, there's projected to be a drastic reduction in the homeless population. If this cat were well nurtured and fed regularly, we could very well put an end to homelessness once and for all within the coming decade. Though the grinches at the ACLU will probably challenge this bill on grounds of being a major human rights violation, history has proven that they only have so much power against the magic of Christmas. Besides a neat and clean act of social cleansing, the economic benefits of a cat this big who eats this many people is that he'll need a yuuuge litter box, the construction of which would create jobs. If all this wasn't enough to convey how brilliant this idea is, as a bonus, Trump will be able to snub Bernie Sanders and his supporters who say we need to be more like Scandinavian countries to tackle economic inequality. "This is the best stimulus package ever conceived by any god or mortal," said President Trump in a press conference. "I'm so glad I thought of it. It's very brilliant; very smart. I'm very smart and brilliant. You libtards won't know what hit you. Merry Christmas. That's right. I said 'Merry Christmas'. We're celebrating Christmas this year. We're not celebrating Kwanzaa like Barack Hussein Obama. He's not here anymore. He's gone back to Africa. Where nothing ever grows, no rain or river flows. Do they know it's Christmastime at all? What a bunch of shithole countries. We need more traditions from countries like Iceland. Merry Christmas."